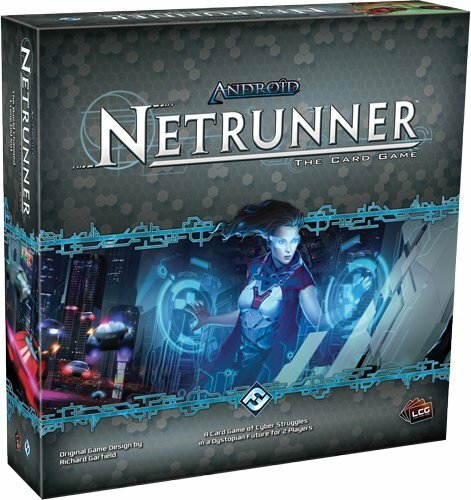 Richard Garfield's classic cyberpunk card game returns cleaner, sharper, moreflavorful, and better than ever with the release of Android Netrunner: TheCard Game! This two player Living Card GameTM of megacorps, runners, andcybercrime pits monolithic megacorps against subversive netrunners in a highstakes struggle for valuable data. Humanity has spread its wings and takentrade to the far reaches of the solar system, having colonized the Moon andMars. Visionary corporations created braintaping techniques that have led tothe development of lifelike artificial intelligence. But as these massivecorporations guard their intellectual property on the network behind layers ofice, netrunners seek to expose their secrets, for ideological reasons or forprofit. From the Manufacturer Richard Garfield's classic cyberpunk card game returns cleaner, sharper, moreflavorful, and better than ever with the release of Android Netrunner: TheCard Game! This two-player Living Card GameTM of megacorps, runners, andcybercrime pits monolithic megacorps against subversive netrunners in a high-stakes struggle for valuable data. Humanity has spread its wings and takentrade to the far reaches of the solar system, having colonized the Moon andMars. Visionary corporations created braintaping techniques that have led tothe development of lifelike artificial intelligence. But as these massivecorporations guard their intellectual property on the network behind layers ofice, netrunners seek to expose their secrets, for ideological reasons or forprofit.